Musician Alobo Naga, who hails from Dimapur is one of the most well known artiste from the Northeast region. He is a singer/songwriter who also writes for serials, films etc. Interestingly, Alobo Naga holds a Licentiate in Music Performance certificate in Contemporary Vocals (LRSL) from the Rock School, London. He is the first from India to pass their examination. He is also the front man of the band, Alobo Naga & The Band (ANTB), an Indian rock outfit from Dimapur which was formed in 2010. Last year in August 2017, late one night Alobo and a few of his friends made a plan to go on a trip to Dzükou valley. The very next morning they drove up to Jotsoma Village via Kohima from Dimapur, got a guide and porter and went up to Dzukou Valley for trekking and also to shoot the music video. It took almost five hours of trekking and climbing to reach base camp. The weather was harsh, with heavy rain cold and extreme fog on the day of the shoot with poor visibility. They were worried after all the effort, sacrifices, trekking and climbing up the hill, if it would be a wasted effort. But they were lucky to get some sunlight once they reached the valley, which took another hour of trekking. This is how the new music ‘A song for Aiko’ came about. It’s a lyrics video with beautiful visuals of Dzukou valley. Most of the shots were by drone so viewers can see a never-before-seen side of the valley. A professional choir and orchestration was used for the music. James Swu, Music Composer and Lecturer of Margret Shishak School of music, Patkai College did the arrangement of the harmony for the choir. Moto, the producer of the album (Kini) from Germany did the overall arrangement of the music. Fans can download/stream the song and the whole album ‘Kini’ from iTunes, Wynk, Artistaloud, Hungama music and almost all online music platforms. 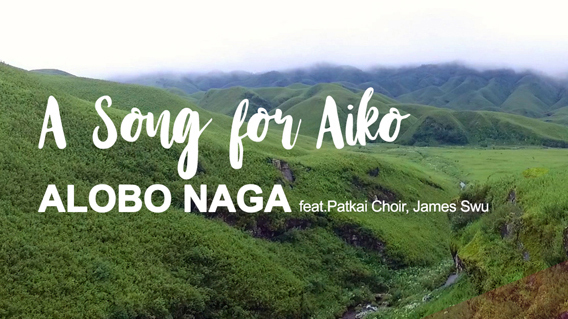 They can watch the video after January 12, from Alobo Naga’s YouTube channel.